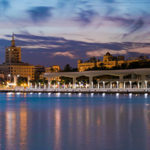 A total of three municipalities in Malaga are among the 25 favorite destinations in Spain by the users of the travel website Tripadvisor. There are a total of nine cities in Andalusia which have entered this ‘ranking’. Specifically there are Granada, Seville, Cadiz, Cordoba, Malaga and the towns of Ronda and Marbella, and Tarifa, in Cadiz province. Spain is currently the fourth country receiving more foreign tourists, just behind France, the United States and China with approximately 53 million tourists per year according to the World Tourism Organization (UNWTO). The classification ‘Traveler’s Choice’ of the most popular destinations is based on the recommendations and comments from users. Ronda ranks fifteenth; Marbella is in 16th position and Malaga city on 18th. Remember that for getting the most from your visit to Malaga, we recommend Malaga car hire as the best choice. Check our prices and compare.